"It’s been a dream of mine since a very young age to reach that No.1 spot," said Farag afterwards. "To do it in such a fashion in front of so many greats of the game, in front of the love of my life [wife, Nour El Tayeb], and my parents watching at home, it couldn’t get any better really… It was very emotional." ElShorbagy’s ranking points for the 2018 Windy City Open - where he took the maximum on offer after winning the tournament - will expire at the end of February. This means Farag will boast a superior points average going into March, which will elevate him to World No.1. In the meantime, ElShorbagy will stay at the top of the PSA World Rankings in February. 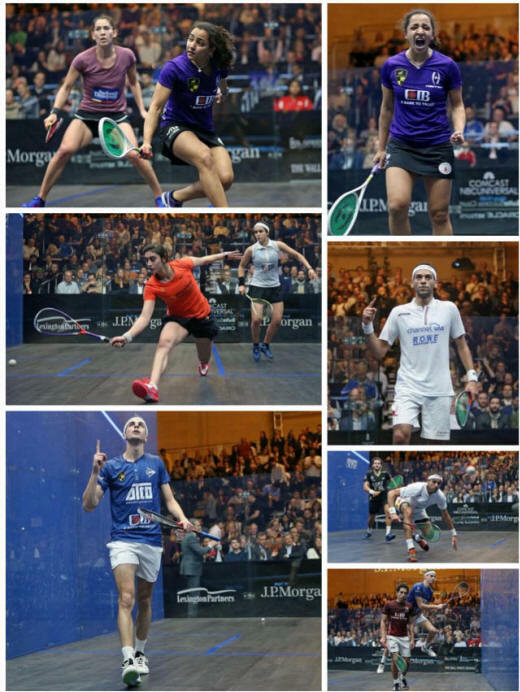 The pair were meeting for the first time since the latter had ended the former’s 31-month reign at World No.1 last month and El Welily - the 2015 Tournament of Champions winner - came into the match with a narrow 10-9 lead on their head-to-head record. “We’ve been battling against each other for so long, the head-to-head is 10-10, so that shows how tough it’s been. We’ve been battling in a lot of finals, sometimes it goes my way, sometimes it goes her way. At the end of the day, the better player is going to win, and I think I was better than her today." 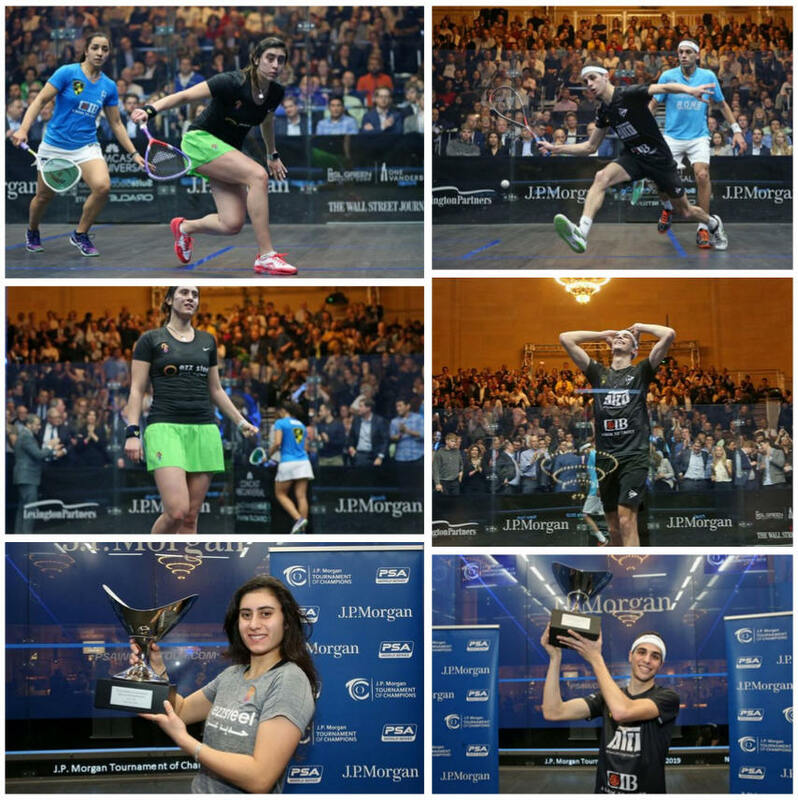 An Egyptian quartet will feature in the finals of the Tournament of Champions for the first time ever as the world’s top four players - Mohamed ElShorbagy, Ali Farag, Raneem El Welily and Nour El Sherbini - get set to do battle for the PSA Platinum title in New York’s iconic Grand Central Terminal. ElShorbagy and Farag will go head-to-head in the men’s final after wins over Karim Abdel Gawad and Tarek Momen. ElShorbagy avenged his defeat to Gawad in last month’s Black Ball Open, a victory which sees him reach the final of this tournament for the third time. The win also means he is guaranteed to retain his \1 ranking in February - a defeat to Gawad would have meant that Farag could have taken top spot had he won the tournament. Harvard-graduate Farag bowed out in the semi-finals of the Tournament of Champions last year after losing to Momen, but this time the win went the way of the former as he closed out a 42 minute ewin to reach his fifth PSA final in a row. The women’s final will also be contested by the World numbers one and two as Raneem El Welily and Nour El Sherbini claimed semi-final wins over Joelle King and Nour El Tayeb. El Welily got her revenge for her Hong Kong Open final defeat against New Zealand’s King as she recovered from a game down to win a high-quality 50-minute battle. 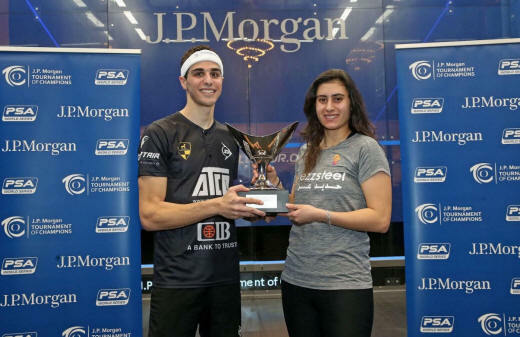 El Sherbini and El Welily will now go head-to-head for the 20th time on the PSA Tour, with El Welily winning 10 of them. 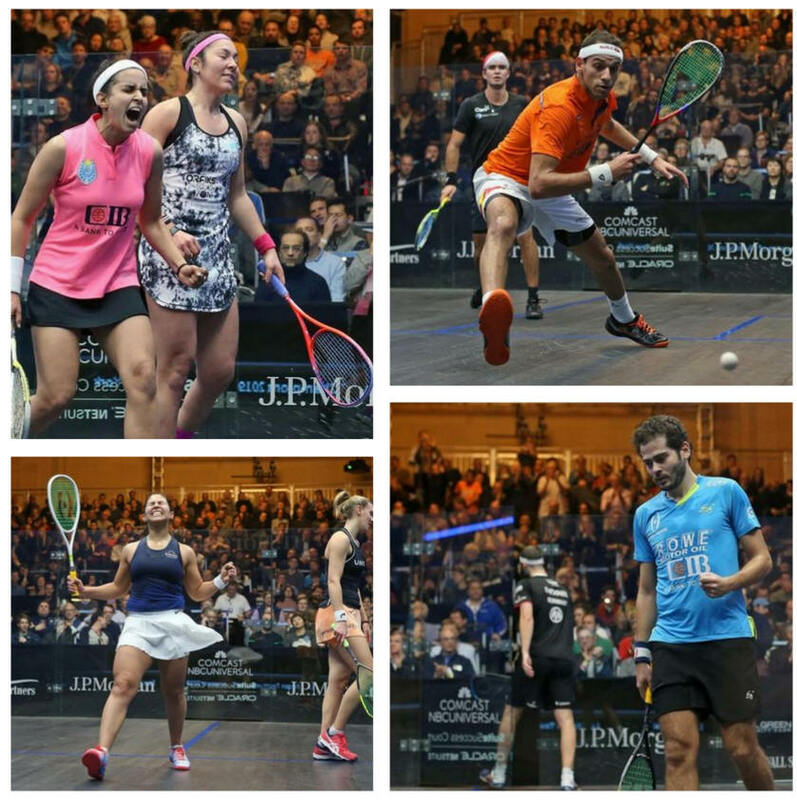 It will be the 12th time that they will have contested a PSA final, and El Welily has taken the win on six of those occasions. King only Non Egyptian in the To semis - Men included!! New Zealand’s Joelle King has become the only non-Egyptian to reach the semi-finals of the Tournament of Champions after she overcame 2017 winner Camille Serme in the second day of quarter-final play in New York. The World #4 will play World #1 Raneem El Welily in the semi-finals in what will be a repeat of their final clash at the Hong Kong Open, where King won her first World Series title. El Welily overcame Nouran Gohar by in just 28 minutes and is now one win away from an eighth successive PSA Tour final - a run which stretches back to last season. The other women’s final will be a repeat of last year’s final as defending champion Nour El Sherbini and World #3 Nour El Tayeb go head-to-head in an all-Egyptian battle. 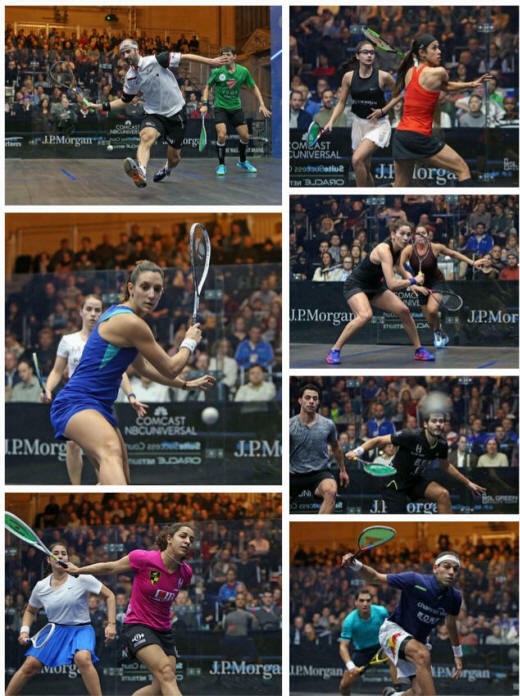 El Sherbini dispatched Salma Hany in straight games, while El Tayeb overcame England’s Alison Waters. An Egyptian Men 'sChampion is guaranteed as second seed Ali Farag and 2018 runner-up Tarek Momen are joining compatriots Mohamed ElShorbagy and Karim Abdel Gawad in the last four. Farag overcame New Zealand’s Paul Coll in straight games to reach the semi-finals of this tournament for the second time. Farag will look to avenge his defeat to Momen in the semi-finals of last year’s tournament, with Momen axing World #17 Omar Mosaad 3-0 to advance to the last four. World # Karim Abdel Gawad ended the title defence of Germany’s Simon Rösner after a commanding performance from the Egyptian saw him move into the semi-finals. “Simon beat me the last two times last season, and he is now the World No.3,” Gawad said after his victory. “He is the defending champion here so it was a very tough match, of course. I had to be very strong mentally in order to win against someone like Simon, especially a 3-0 win." The day’s other men’s quarter-final saw World #1 Mohamed ElShorbagy prevail in a thrilling five-game battle with Peruvian Diego Elias to avenge his defeat against the World #11 in November’s Qatar Classic. 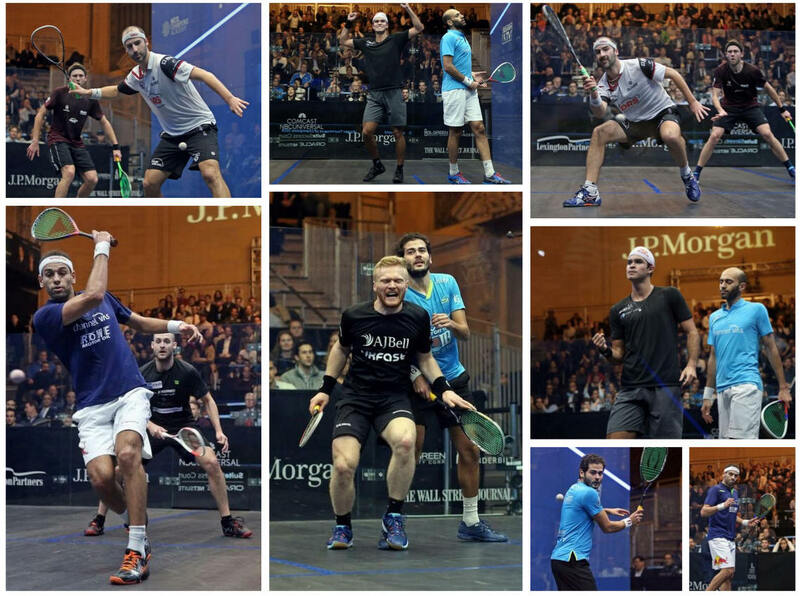 ElShorbagy and Gawad will meet in a repeat of the Black Ball Open quarter-finals, with Gawad prevailing en route to winning the tournament. The women’s third round took place today and saw both of the remaining US players exit the tournament as World #11 Amanda Sobhy and World #19 Olivia Blatchford Clyne suffered respective defeats against Egyptian duo Nour El Tayeb and Nour El Sherbini. El Sherbini will play fellow Egyptian Salma Hany for a place in the semi-finals after the World #16 upset two-time runner-up Laura Massaro to win in straight games. 22-year-old Hany will now compete in the last eight of a PSA Platinum event for the first time. Elsewhere, top seed Raneem El Welily got the better of India’s Joshna Chinappa and she will play World #8 Nouran Gohar next in a repeat of their five-game clash in the semi-finals of the Hong Kong Open. Meanwhile, New Zealand’s Joelle King claimed just her second career victory over Malaysian legend Nicol David at the 12th attempt to set up a quarter-final fixture with 2017 champion Camille Serme. The day’s final third round match was an all-British battle as England’s World #9 Alison Waters defeated Welsh World #10 Tesni Evans by a 3-2 scoreline. “Of course, how can you not hear this crowd,” Sobhy said to the home crowd. “You guys are awesome, and I love it so much. I don’t really get that many home tournaments but when I do, you guys bring the hype, so I appreciate it." The bottom half of the men’s quarterfinal lineup was decided on Sunday, the first men’s match of the day ended prematurely as India’s Saarav Ghosal was forced to retire due to injury in the second game against New Zealand’s Paul Coll. 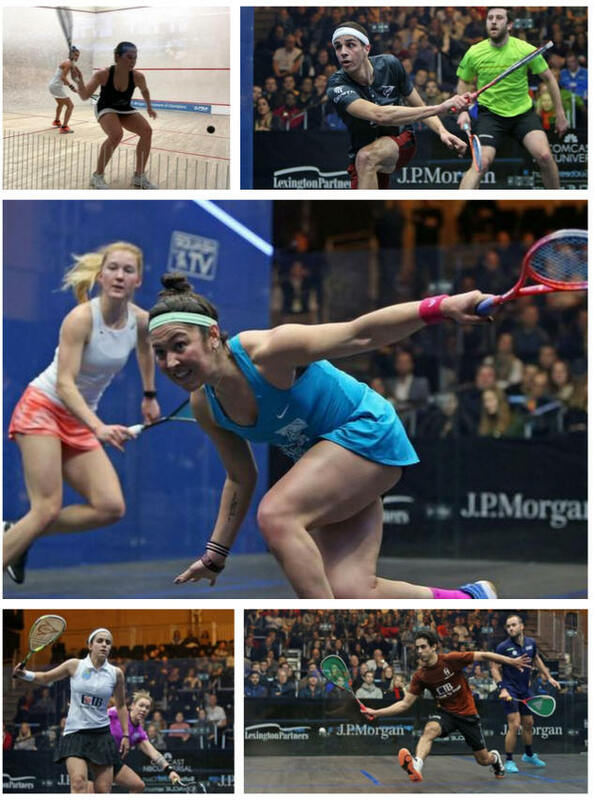 Coll will face Egypt’s world Ali Farag after the second seed dispatched English veteran Daryl Selby in an hour-long three games - mounting sizable comebacks and saving at least one game ball in in each game. “Right now, I could easily have been sat down, losing 3-0,” Farag said. “All games could have gone either way, and actually, they were closer to going his way. I am just very happy that I stayed calm, I never panicked. All credit to Daryl, he never made it easy at any point. I am very relieved to be through." 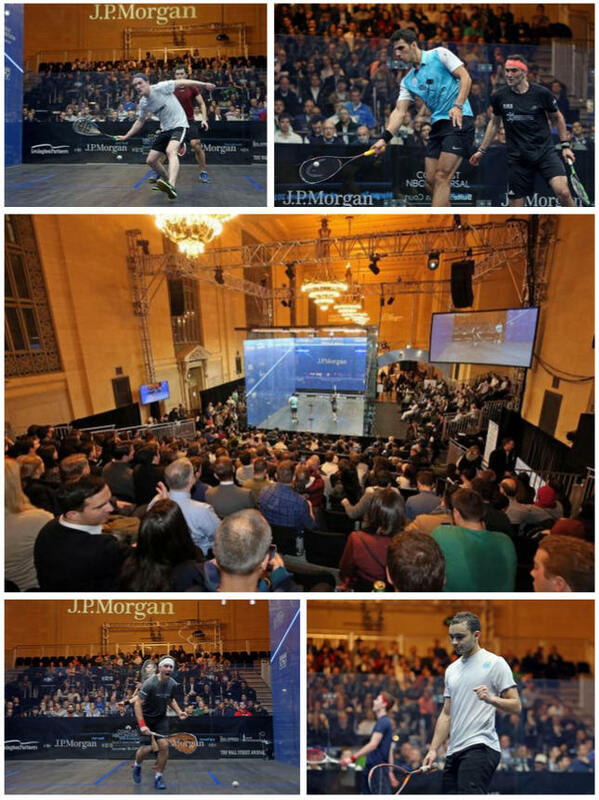 Farag is seeded to meet compatriot Tarek Momen in a semifinal rematch of the 2018 ToC after Momen held off a formidable challenge from France’s Gregoire Marche in four games and sixty-seven minutes. Momen will have to get past a resurgent Omar Mosaad in the quarterfinals first, however, after the ‘Hammer of Thor’ recorded a three-game victory against Scotland’s Greg Lobban. The women’s second round and first half of the men’s round of sixteen will take to the all glass court in Vanderbilt Hall from noon local time on Saturday. Day two almost saw a big upset as Welshman Joel Makin went two games up against World No.5 Karim Abdel Gawad, only to see an ankle injury cruelly end his chances of a victory. A series of fine displays this season have seen Makin climb from No.38 in the world to No.23 over the past five months and he dominated the in-form Gawad to go two games ahead and 4-3 up in the third. But he rolled his ankle after contact with Gawad mid-way through a rally and he was unable to continue, meaning Gawad moves through to the third round, where he will play compatriot Fares Dessouky. “He played really well and he was dominating. 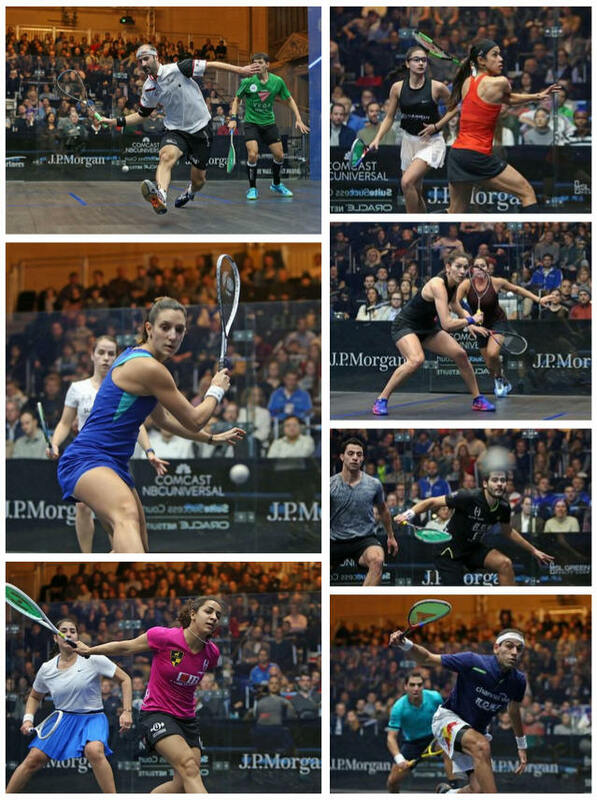 I was having a really hard time, especially today when I was not playing my best squash. 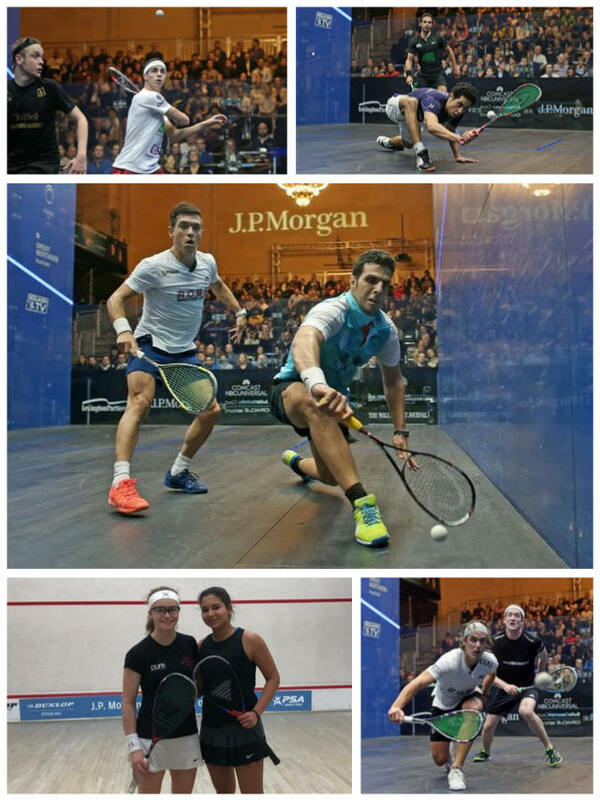 He was playing his best squash so of course it is very bad for him.” Gawad admitted. I wish him the best of luck to recover" he concluded. Rösner will play Hong Kong’s Max Lee in the next round after Lee overcame a Cesar Salazar in straight games with Salazar seemingly not fully fit, and they will be joined in the last 16 by World No.1 Mohamed ElShorbagy, who defeated Nicolas Mueller 3-0 in less than 30 minutes. ElShorbagy suffered a shock defeat to Cuskelly in the second round of last year’s event, but the two-time Tournament of Champions winner was unstoppable against his Swiss counterpart. Egypt’s Zahed Salem lies in wait for ElShorbagy in round three, with the World No.25 getting the better of Malaysia's Eain Yow Ng in four games. Elsewhere, Peru’s Diego Elias got the better of World No.8 Marwan ElShorbagy by a 3-1 margin to book his place in round two. Elias will line up against Australia’s Cameron Pilley in the next round, with Pilley progressing courtesy of a 3-0 victory against England’s Tom Richards. The women’s tournament gets under way tomorrow, with fixtures spread between the Harvard Club, New York Athletic Club and the Princeton Club. One out of Three Americans make it to round two, while it's three out of three for the French! Harrity was backed on by a partizan crowd in New York and the 28-year-old from Wayne rose to the occasion as he came back from a game down to earn an a four-game victory – securing his place in the second round of this tournament for the first time in his career. Grégoire Marche and Lucas Serme created upsets as Marche ousted Germany's Raphael Kandra, while Serme had to work for 78m to beat Englishman Declan James in five - they meet in round two!